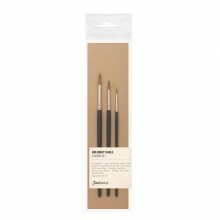 The Jackson's Kolinsky Sable Series 920 Brush is made with pure Kolinsky Sable hair. Created with good holding capacity and fine point, this brush represents incredible value for money. The Jackson's Kolinsky Sable Series 921 Brush is a very long haired brush made with Pure Red Sable hair. Sometimes known as a rigger this brush is designed to hold enough colour to give a long and steady line. Ideal for rigging, telegraph lines, branches, long grasses and other fine lines. We at Jackson's Art Supplies are all artists and we understand that artists are looking for the best materials at the best prices. To answer this need we have created ranges of our own brand art materials. The Jackson's brand means good quality and excellent value.